Applied Singapore citizenship on June 2014, it took more than 10 months for ICA to process my application, 24th April, I opened my mailbox as regular, found one letter from ICA, it was one page and I thought it was a reject letter, normally one page letter is always rejection letter, but when I saw ‘We are pleased to inform you that…’, it was approved, the date is 19th April, took one week to reach my mailbox. The next steps are e-Journey, Singapore Experiential Tour and Community Sharing session, just complete the e-journey on Saturday, takes around one hour to watch some video, just for some introduction of Singapore history, culture, national anthems, flag, working, living in Singapore, etc. Arranged the Experiential Tour on 16th May, it is a Saturday. and the community sharing is on 29th May, Friday evening at Pasir Ris Punggol community club. site and now this time I am browsing this web site and reading very informative posts here. 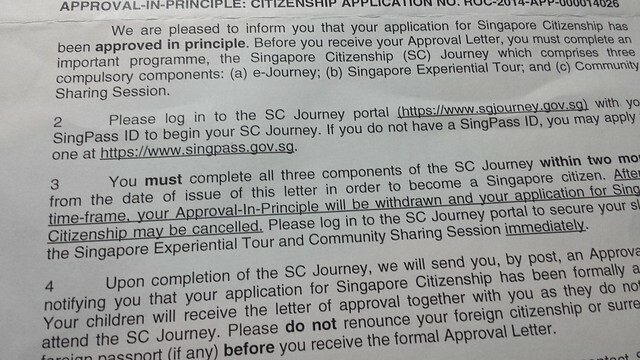 Hello, may I know what you felt about the Singapore Citizenship Journey? Was the SC journey beneficial to you in anyway? In case you’re wondering, my group and I are working on a project and we would like to know more about the SC journey from new citizens or people who have been through the SC journey. We hope that you’ll be willing to share your experience with us. Thank you! Hi Yun Ting, thanks for your post. The Singapore Citizenship Journey program was a good experience for me, I would not over praise it as substantial change to anything, but I can see a good gesture from Singapore government to embrace us new citizens, and this is meaningful and important to us. As the first generation immigrants, compare to those who grew up here or move here at younger age, it was not an easy decision for us to obtain new Citizenship, settle down here, and harder for us to integrate into Singapore society. Hello there! May I know what do they do during the community sharing session? I am going for one soon and just wanted to find out more about it 🙂 thank you! The community sharing is just like group sharing or discussion, about personal experience and difficulty to integrate and living in SG, expectation and wishes after joining the Citizenship, normally they will arrange new citizens came from same area to sit together. Hope this help..
Hey man, i got the AIP letter too which is yesterday and when i tried to log in into the sg journey portal it says ‘ error processing your login please try again later ‘ . May i know whats wrong? cause ive tried using various website such singpass, cpf etc etc and they all work perfectly fine and they is nothing wrong with it. Hi Nick, not sure what’s the problem, you may want to contact technical support on the sg journey? Ive called them and they say 4 working days they will call me. I just hope they will make it ASAP. Anyway thanks man! hi how did you finally solve the problem? How long did it take for ICA to process your application for Singapore citizenship? Also, once your citizenship is approved, does ICA require you to provide proof of employment ? In my case, I applied in June 2017 and am still waiting. Also, I plan to go back to university soon. What are the steps after SG Journey and community sharing session to get citizenship? Hi, I just completed my css session yesterday. However, my due to complete is tomorrow. But my css component still haven’t updated to the system. May I know will it affect the result that I didn’t finished the 3 component within the period? Thanks for advise. Can I just ask, if I am able to log on SCJ site before receiving the AIP letter, does it means my application has been successful since the SCJ account has been created for me? I think your understanding is correct. Good luck. I applied SC in Nov 2017 via online and made appointment in May 2018 to submit documents. On 28th of Feb 2019, I checked online under myICA, showed rejected. The next day, I checked myICA, didn’t show any rejected or approval or processing. Just come out one page to apply Singapore Citizenship. Besides, I checked I Enquiry from ICA website, still showing pending. I called ph auto machine, also say pending. I called ICA so many times and asked officers. Some say pending, some say final stage, some say the outcome is out on 2nd of March and wait for official letter. May I know ICA website got system error? Anyone got same problem like me? Anyway, I am preparing to face the truth. Just wait for the physical letter from ICA. The status appears in iEnquiry is very slow. You can try to write email to ICA to enquiry.